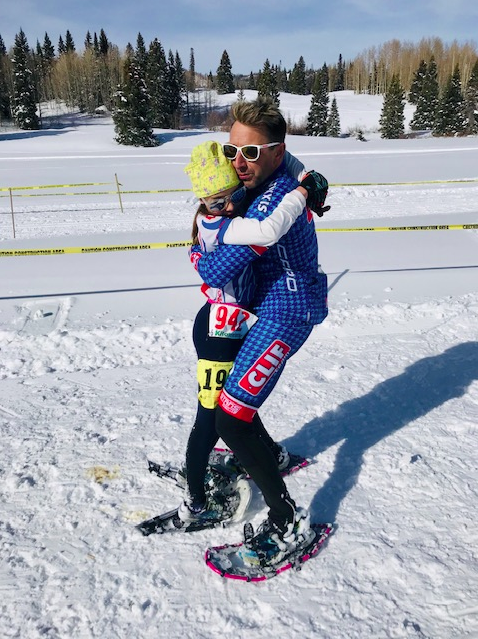 pic by HP Yogin Kavík of your feeble teacher of no-thing embracing Rinpoche Dewachen Ilg (11) as She CLOBBERED Her 15-Under Categories in both the 6k Classic Ski, 6k Snowshoe and went on to finish 6th Overall in the Adult Combination. Her daddy did okay too; 5th OA in 18k Freestyle Ski, 1st Overall in Fat Tire Bike Race, 2nd King Of The Mountain (12k Classic into 6k Snowshoe) and OVERALL CHAMPION; MONARCH OF THE MOUNTAIN (fastest male finisher of ALL Four Sports Over The Two Days Of Racing. See ilg’s Social Media feeds for very inspiring video from both days! the DRIVE DOWN to Chama, dude...ilg KNEW to arrange the Daddy and Dewa (father/daughter time) drive fr(om) Durango to Chama during morning Brahmamuhurti (God/High Pranic Hours of Twilight Morning). Arrive at Race venue early to test ski waxes. 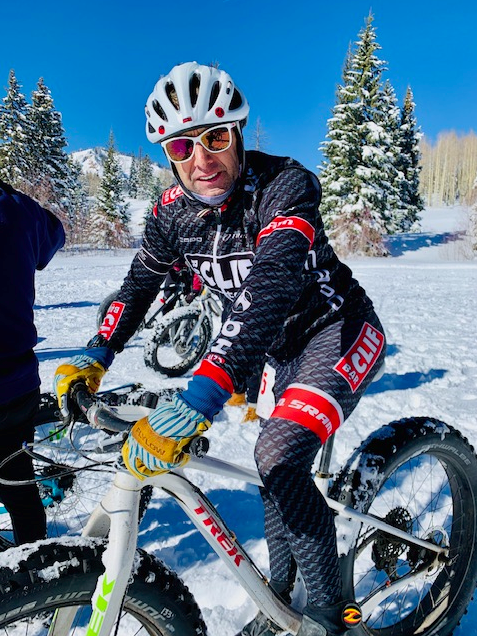 ilg races the 18k Freestyle into 6k Fat Bike into teaching Yoga For Racers. Dewa (11) is ilg's support crew. 18K Freestyle: ilg realizes ilg has waxed a fast pair of Fischer carbon skis. due to Trump Admin, there is an absolute dearth of ilg’s sponsored waxes fr(om) Swix. thanks to a Devotee? ilg receives an EcoFriendly set of waxes with which? ilg has zero experience in both application and use. does ilg’s best. ilg advises new Race Director Melissa on Start Orders to keep everyone safe as the Flag Goes Down. IF YOU WOULD LIKE TO DONATE TO HELP ILG FINISH MY 20/19’20 WINTER RACING Season? ilg soooo needs your $ support! 6K Fat Tire Bike Race: ilg signed up for the 6k, not the 18k only because ilg had to teach YOGA FOR RACERS. gun went off. the course was soooooo soft that ilg literally began the race pushing my Trek® carbon fatty to the ski course where the snow was more c(om)pressed. followed Michael G (pro MTB) and two others out of the start to learn about their tire pressure and body mechanics as we rode out of Stadium Meadow towards Stadium Hill (the first of several uphill headwalls). 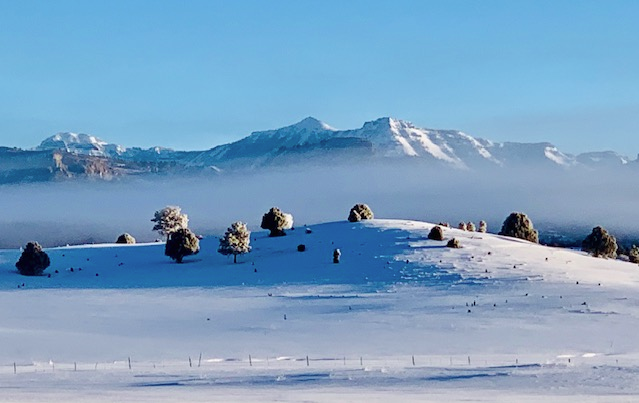 made an early decision at 800 meters to just GO, cuz ilg could see that ilg had much better Mula Bandha (yogic term, come to my classes) and tire pressure floatation; THANK YOU PAGOSA MOUNTAIN SPORTS! ilg took off attacking Stadium Hill and merged into Zen Pain and finished FIRST OVERALL; second place? nearly a quarter hour back!!! spoke to the newly minted Race Director and convinced her to execute an immediate change. make the 18k into a 12k for the sake of safety of all the race marshalls and racers. only a few could ride the sections ilg did and they were pushing their bikes and punching knee deep holes into the soft ski course for tomorrow. Gleefully, the RD listened to ilg and shortened the course. 12K Classic: ilg rarely messes up wax call. today? ilg did. long story; thanks to Trump Admin/gov shutdown? my main wax sponsor, SWIX is NOT ALLOWED to ship racing waxes internationally. ilg – thanks to a Devotee – defaulted to a wax line with whic ilg had zero experience. thing is, on Day One ilg had great, fast ski wax cuz it was cold. Day Two Classic style? where waxing is pivotal? The weather warmed considerably and? well? ilg missed the wax – since ilg had to wax two day previous to Race Day due to Daddyhood, etc, – stayed with the lead group of 5 for nearly halfway, then, ilg’s wax gave out. ilg was slipping on the uphills and slow on the downhills. Dat’s part of Nordic racing. missing the wax sets up a helluva realm of even more painful suffering upon an already painful sport. was stoked to finish 6th. 6k Snowshoe: trust ilg. the LAST THING you want to do after racing on your second day at high altitude (tickling 10,000′) and finishing just off the Leaders in a grueling 12k Classic Ski Race? Is to snowshoe race. Snowshoe racing is by a significant margin, the most painful, horrid, slow, laborious action of all Winter Endurance Sports; and it just so happens to be the ORIGINAL WINTERSPORT OF ALL HISTORY, so? That makes snowshoe racing the ultimate winter sport in ilg’s book. so? in contention for the King Of The Mountain competition once again, ilg transitioned from Classic Nordic Ski Racer to Sport Snowshoe Racer still cross-eyed with fatigue from the 12k Classic. ilg started okay out of the Stadium to the crooning cheers of the amazing spectators who had been witnessing ilg’s ongoing suffering for the past two days across all the sports offered. mantra, rhythm, Big Toe Push Off, Arms Drive The Legs..ilg was using ALL my coaching affirmations. by halfway, ilg was still in 5th overall in the Snowshoe Race. on the Grind toward High Point? dismantling struck. zero knee lift. collapsed upper body posture. mental wandering. ugh. had to finish. my once paralyzed spine suddenly sparked. stopped on the race course. dropped into yogi squat. engaged Mula Bandha. did a special Pranayam to vent the pain in ilg’s poor pelvis/lumbar spine. got up. felt like the walls were caving in. nearly passed out. put one foot in front of the other. continued in Trance Pain until Finish Line. The Real Result: after the Rooster Tails fr(om) us snowshoer’s settled? 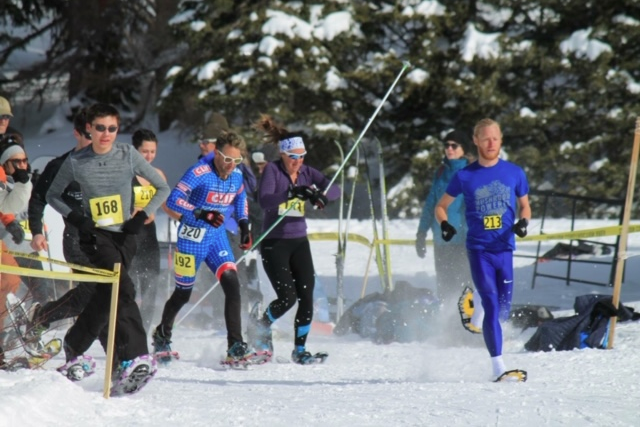 ilg did what it took to finish 2nd Overall in the King Of The Mountain Competition (12k Classic into 6k Snowshoe) to twenty-something Logan Ott of Durango Nordic upbringing. ilg can live with that. ilg did ilg’s Noble Best out there and came up 6-minutes short of the King Of The Mountain competition. ilg finished FIRST OVERALL in the Monarch Of The Mountain Competition which is the fastest racer across ALL the four sports offered in the 2 Days of racing. Wholistic Fitness® trained warrior/ess’s!? yup, we got your number. cuz, y’all specific athletes might easily beat us in the sport you are good at, yet? start linking up the sport to really test the most versatile (athletic) Warrior? we got you. and there is no way in hell anyone will outperform a Master Student of WF across the physiologic spectrum. the Outer World will Awaken to the Noble Integrity of a Wholistic Fitness® Wariror/ess. seeking Wholeness instead of specificity. ps; ilg is currently leading both the Twilight Night Snow Master Series and the Southwest Nordic Cup at age 56.